This publication covers the specification, design, installation and operation of metering stations for high accuracy measurement of the bulk flow of gases in pipelines and process plants. It was first published in 1991, this edition being updated to incorporate new technology and the latest standards. The types of metering equipment described are intended for the measurement of natural hydrocarbon gases for the purposes of sales, custody transfer, taxation or the allocation of production in a multiuser pipeline; dependent on usage these can generally all be termed custody transfer. Such systems will be referred to in this guide as fiscal metering systems, implying a standard of accuracy that is the highest that can reasonably be obtained in a practical industrial environment, bearing in mind the balance between cost and accuracy. 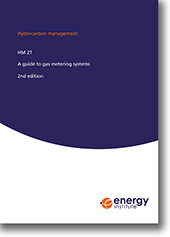 This guide will also be of use in the design and specification of metering systems that are not required to meet fiscal standards of accuracy such as those used for plant operational purposes and equipment performance monitoring. Compliance with this guide and the relevant standards to which it refers should assist approval, where appropriate, by the UK Government [OGA, Petroleum Operating Notices PON6, Guidance Notes for Petroleum Measurement – For systems operating under the Petroleum (Production) Regulations, Issue 9.2, October 2015, Chapter 2.9.] and other regulatory authorities.